The decorative art of painting on metal is known as tole. The word ‘tole’ is French for sheet iron, and it was from sheet iron that the earliest examples of decorated metalware were made. This dates back to seventeenth-century Europe, when trade with the Far East was flourishing and for the first time Europeans came into contact with imported Japanese and Chinese objects, beautifully decorated with ornamental lacquerwrork. They were an imme­diate success, and demand soon outweighed supply. As the pieces were extremely expensive, European craftsmen began to copy the techniques and style of oriental lacquerwork onto metal household objects, using a process whereby paint could be applied to tin. The metal is moulded into attractive shapes, sometimes with pierced or scalloped edges, giving toleware a delicate appearance. It comes in a won­derful variety of colours, from dark greens, red and blues to creams and pastels, beautifully decorated and with a rich, effective use of gold paint either in the applied design or as a contrast round the rim. This painted tinware became fashionable for items such as tea, coffee and chocolate tins. In the late seventeenth century, most coffee houses stored their beverages in painted tinware boxes which were hygienic, cheap, practical and, above all, attractive to look at. They would brighten up an interior in a way that earthenware pots could not do. Like many fashions, tole eventually lost its popu­larity and there is now very little around. Antique tole items are highly collectable and can be worth almost as much as the lacquerwork they originally copied. Not surprisingly, tole has now become fash­ionable again and it is possible that modern pieces of hand-painted reproduction tole, made using tradi­tional methods and designs, could be the valuable antiques of the future. However, for the present, just one or two of these attractive reproductions, such as a wastepaper basket or wall sconce, can make all the difference to the look of a room. 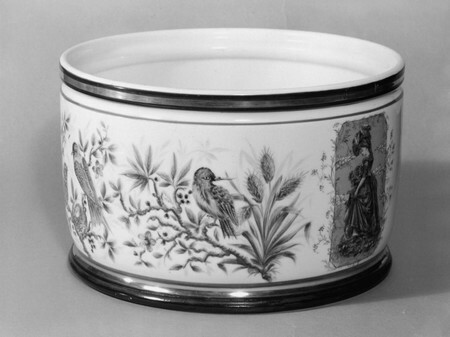 One of the most popular uses of tole is for cache-pots, the French name for plant holders. 19 mm (3/4 in) masking tape. Using the 5 cm (2 in) brush, paint the outside of the cache-pot with metal primer. Leave it to dry for at least 16 hours. Using the same brush, cover the primer with a coat of dark red eggshell paint. You can use two coats of this if you wish, leaving each coat to dry for 16 to 24 hours. When the red paint is completely dry, attach vertical strips of masking tape at regular 5 cm (2 in) intervals round the outside of the cache-pot over the red paint. Decorate the spaces in between these strips with stick-on stars. After you stick on the masking tape and stars wipe over the edges with a clean cloth, to make sure they are completely stuck down. This will prevent any seepage when the next laver of paint is applied. When you have checked that the strips and stars are firmly attached, carefully apply the green eggshell paint all over the cache-pot. You don’t have to paint over all the masking tape as long as you make sure the edges are covered with green, but it is a good idea to paint over the stars so that you get a clear definition of their shape. Leave to dry for 24 hours. Carefully peel off the masking tape and stars to reveal the red pattern underneath.